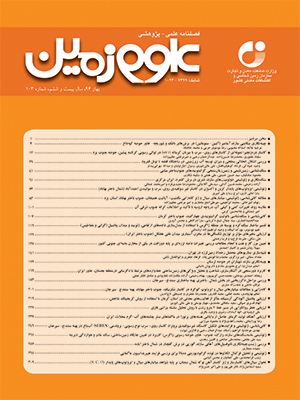 «کانسنگ سفید» قابل تقسیم است. کانسنگ سفید در بخش های بالایی کانسنگ سولفیدی اولیه و به صورت جانشینی بخش های کربناته سنگ میزبان با عیار بالای روی و عیار پایین آهن و سرب و کانسنگ نوع سرخ به صورت جانشینی مستقیم کانسنگ سولفیدی اولیه با عیار پایین روی، عیار بالای آهن و عیار متوسط سرب و آرسنیک در مقایسه با کانسنگ سفید، تشکیل شده اند. کانی‌شناسی کانسنگ برونزاد، شامل اسمیت زونیت، هیدروزینسیت، سروزیت، رس های غنی از روی، گرینوکیت، کوولیت و اکسیدهای آهن و منگنز است. بخش غیرسولفیدی کانسار آب‌باغ در طول هوازدگی طولانی‌‎مدت بخش سولفیدی کانه زایی رسوبی- بروندمی (SEDEX) اولیه، در اثر اکسایش و انحلال پیریت، اسفالریت و گالن تشکیل شده است. اکسایش کانی های سولفیدی، خنثی سازی اسید و تشکیل کانی های کربناتی روی به‌عنوان فرایندهای اصلی ژئوشیمیایی مؤثر در تشکیل کانسنگ برونزاد در این کانسار شناخته‌ شده‌اند. الگوی عناصر کمیاب خاکی کانسنگ برونزاد نوع سفید و نوع سرخ متفاوت است؛ به‎گونه ای که در کانسنگ نوع سفید الگوی عناصر کمیاب مشابه سنگ میزبان و در نوع سرخ مشابه کانسنگ سولفیدی است. مقایسه فرایندهای مؤثر در تشکیل کانسنگ هوازده برونزاد کانسار آب باغ با دیگر کانسارهای غیرسولفیدی برونزاد در ایران؛ همانند کانسارهای مهدی آباد، چاه تلخ، مجموعه ایرانکوه و معادن غیرسولفیدی کوهبنان- بهاباد، نشان از همانندی کانسار آب باغ با کانسارهای کلاه دروازه، از مجموعه معادن ایرانکوه و مهدی آباد یزد است. همچنین، بخش برونزاد کانسار آب باغ از دید ویژگی‎های کانی شناسی و انواع کانسنگ برونزاد، قابل مقایسه با کانسارهای غیرسولفیدی مراکش است. The Ab-Bagh Zn-Pb deposit is located in the central part of the Sanandaj-Sirjan zone (SSZ) and at the southeastern part of the Malayer-Esfahan metallogenic belt. This deposit is hosted by Upper Jurassic-Lower Cretaceous sedimentary sequence. Zinc and lead mineralization occurred within two horizons. The ore horizon 1 is hosted by Late Jurassic-Early Cretaceous black shale and siltstone. The ore body displays a wedge-like shape and is located close to syn-sedimentary fault. The ore horizon 2 occurs in lower Cretaceous carbonates and includes a massive ore facies that is concordant with host rock layering. It is also underlain by a stockwork facies. Weathering processes led to a supergene ore stage at Ab-Bagh deposit in parts toward the surface. Based on geology, mineralogy and geochemistry, two types of non-sulfide ore were distinguished: the white ore and the red ore. The white ore is a wall-rock replacement mineralization that contains high Zn, low Fe and a very low concentration of Pb. To the opposite, the red ore formed after the direct replacement of sulfide protore and it typically contains low Zn, high Fe and medium Pb± As concentrations. Supergene ore consists of smithsonite and hydrozincite. Minor cerussite, Zn-rich clays, greenockite, covellite and Fe-Mn oxides were also identified. The supergene part of the Ab-Bagh deposit formed as a consequence of long time weathering of a SEDEX-type sulfide protore. Oxidation of sulfide minerals (mainly pyrite and sphalerite), carbonate buffering reactions and precipitation of secondary Zn-bearing minerals are the main geochemical process involved. The REE patterns of the white non-sulfide ore are similar to that recorded in the host rocks but REE patterns of red ore, is similar to sulfide ore. The comparison with other major non-sulfide Iranian deposits suggests that Ab-Bagh deposit is very similar to Kolahdarvazeh and Mehdiabad deposits; it also shows lots of similarities with other worldwide examples (e.g. Moroccan non-sulfide ore deposits). امیری، ع.، قربانی، م.، اکبرزاده، ع. و شجاعی باغینی، و.، 1384- نگرشی نو بر کانسارهای استراتاباند غیرسولفیدی روی و سرب در ناحیه کوهبنان- بهاباد. مجموعه مقالات نهمین همایش انجمن زمین‎شناسی ایران. صص. 375 تا 385. آقانباتی، ع.، 1383- زمین‌شناسی ایران. وزارت صنایع و معادن، سازمان زمین‌شناسی و اکتشافات مواد معدنی کشور، 586 ص. رضائیان، ع.، رسا، ا.، جعفری، م.، امیری، ع. و خسروتهرانی، خ.، 1389- دولومیتی شدن اپی‌ژنتیک، راهنمای اکتشافی کانسارهای روی و سرب غیرسولفیدی با سنگ میزبان کربناته، مطالعه موردی: کانسار روی و سرب چاه تلخ (سیرجان). فصلنامه زمین و منابع، سال سوم، شماره چهارم، صص. 31 تا 40. موحدنیا، م.، 1394- رخساره­های کانسنگی، ژئوشیمی و تیپ کانه­زایی روی-سرب (باریم) در کانسار آب­باغ (کهرویه)، جنوب شهرضا، پهنه سنندج-سیرجان. پایان‌نامه کارشناسی ارشد، دانشگاه تربیت مدرس، تهران. موحدنیا، م.، راستاد، ا. و رجبی، ع.، 1393- بررسی ویژگی­های ژئوشیمیایی عناصر فرعی و کمیاب کانی­های اسفالریت و گالن در کانسار روی و سرب آب­باغ، جنوب شهرضا، پهنه سنندج-سیرجان. هجدهمین همایش انجمن زمین­شناسی ایران، تهران. Amundson, R. G., Chadwick, O. A. and Sowers, J. M., 1989- A comparison of soil climate and biological activity along an elevation gradient in the eastern Mojave Desert. Oecologia, 80: 395–400. Appold, M.S. and Monteiro, V.S., 2009- Numerical modeling of hydrothermal zinc silicate and sulfide mineralization in the Vazante deposit, Brazil. Geofluids 9:96–115. Boni, M. and Large, D., 2003- Non-sulfide zinc mineralization in Europe: an overview. Economic Geology 98:715–729. Borg, G., 2002- The good, the bad and the ugly-a maturity index for supergene non-sulphide deposits. Geological Society of America, Program with Abstracts 34/6, p. 287. Borg, G., Kärner, K., Buxton, M., Armstrong, R. and Schalk, W., 2003- Geology of the Skorpion non-sulphide deposit, southern Namibia. Economic Geology 98: 749–771. Bradbury, M. H. and Baeyens, B., 1999- Modelling the sorption of Zn and Ni on Ca-montmorillonite. Geochimca Cosmochimca Acta 63:325–336. Brugger, J., McPhail, D.C., Wallace, M. and Waters, J., 2003- Formation of willemite in hydrothermal environments. Economic Geology 98: 819–835. Choulet, F., Buatier, M., Barbanson, L., Guegan, R. and Ennaciri, A., 2015- Zinc-rich clays in supergene non-sulfide zinc deposits. Miner Deposita 51: 467–490. Choulet, F., Charles, N., Barbanson, L., Branquet, Y., Sizaret, S., Ennaciri, A., Badra, L. and Chen, Y., 2014- Non-sulfide zinc deposits of the Moroccan high atlas: multi-scale characterization and origin. Ore Geol Rev 56: 115–140. Churakov, S. V. and Dähn, R., 2012- Zinc adsorption on clays inferred from atomistic simulations and EXAFS spectroscopy. Environ Sci Technol 46:5713–5719. Cooke, D. R., Bull, S. W., Large, R. R. and McGoldrick, P. J., 2000- The importance of oxidized brines for the formation of Australian Proterozoic stratiform sediment-hosted Pb-Zn (Sedex) deposits. Economic Geology, 95: 1–18. Daliran, F. and Borg, G., 2004- Nonsulphide zinc deposits, Iran: a preliminary study of the zinc ores at Angouran mine, NW-Iran. BGR Reihe Berichte zur Lagerstätten- und Rohstoffforschung. BGR, Hannover (103 pp.). Drever, J. I., 1997- The Geochemistry of Natural Waters: Surface and Groundwater Environments, 3rd edition. Prentice-Hall International, New Jersey. 436 pp. Goodfellow, W. D. and Lydon, J. W., 2007- Sedimentary-exhalative (Sedex) deposits, In: Goodfellow, W.D., (eds. ), Mineral deposits of Canada: A synthesis of major deposit types, district metallogeny, the evolution of geological provinces, and exploration methods. Geological Association of Canada, Mineral Deposits Division, Special Publication 5, p. 163–183. Goodfellow, W. D., 2007- Base metal metallogeny of the Selwyn Basin, Canada, In: Goodfellow,W.D., (eds. ), Mineral Deposits of Canada: A Synthesis of Major Deposit-Types, District Metallogeny, the Evolution of Geological Provinces, and Exploration Methods. Geological Association of Canada, Mineral Deposits Division, Special Publication No. 5, p. 553-579. Herbert, R. B., 1999- Sulphide oxidation in mine waste deposits: a review with emphasis on dysoxic weathering.Mitigation of the environmental impact from mining waste (MiMi). MiMi Print, Luleå, Sweden. Heyl, A. and Bozion, C. N., 1962- Oxidized zinc deposits of the United States. Part 1. General Geology. Geological Survey Bulletin 1135-A, 1–52. Hitzman, M. W., Reynolds, N. A., Sangster, D. F., Allen, C. R. and Carman, C., 2003- Classification, genesis and exploration guides for nonsulphide zinc deposits. Economic Geology 98, 685–714. Holland, H. D., 2005- Sedimentary mineral deposits and the evolution of earth’s near-surface environments. Economic Geology, 100th Anniversary Special Paper 100: 1489-1509. Kelley, K. D., Leach, D. L., Johnson, C. A., Clark, J. L., Fayek, M., Slack, J. F., Anderson, V. M, Ayuso, R. A and Ridley, W. I, 2004- Textural, compositional, and sulfur isotope variations of sulfide minerals in the Red Dog Zn-Pb-Ag deposits, Brooks Range, Alaska: Implications for ore formation. Economic Geology 99: 1509–1532. Large, R. R., McGoldrick, P., Bull, S. and Cooke, D., 2004- Proterozoic startiform sediment-hosted zinc-lead-silver deposits of northern Australia, in: Deb, M. and Goodfellow, W.D., (eds. ), Sediment-hosted lead-zinc sulphide deposits: Attributes and models of some major deposits of India, Australia and Canada. Narosa publishing house, Delhi, India, p. 1-24. Maghfouri, S., Hoseinzadeh, M. R., Rajabi, A., Azimzadeh, A. M. and Choulet, F., 2014- Geology and origin of mineralization in the Mehdiabad Zn-Pb-Ba (Cu) deposit, Yazd block, Central Iran. 13th SGA Biennial Meeting 2015. Proceedings, Volume 5. Momenzadeh, M., 1976- Stratabound lead–zinc ores in the lower Cretaceous and Jurassic sediments in the Malayer–Esfahan district (west Central Iran): lithology, metal content, zonation and genesis [Unpublished Ph.D. thesis]. Heidelberg, University of Heidelberg, 300 p.
Morrissey, C. J., 1970- The Mineralogy, Structure and Origin of the Lead–Zinc Copper Residual Ore Body at Tynagh, Co., Galway, Ireland. (dissertation) Imperial College, London University, Stuttgart. Movahednia, M., Rastad, E., Rajabi, A. and Choulet, F., 2014- The Ab-Bagh Stratiform and Stratabound Zn-Pb Deposit, Sanandaj-Sirjan Zone, Iran. 13th SGA Biennial Meeting 2015. Proceedings, Volume 5. Peck, W. P., Volkert, R. A., Mansur, A. T. and Doverspike, B. A., 2009- Stable isotope and petrologic evidence for the origin of regional marble-hosted magnetite deposits and the zinc deposits at Franklin and Sterling Hill, New Jersey Highlands, United States. Economic Geology 104:1037–1054. Rajabi, A., Rastad, E. and Canet, C., 2012- Metallogeny of Cretaceous carbonate-hosted Zn–Pb deposits of Iran: geotectonic setting and data integration for future mineral exploration. International Geology Review, 54: 1649-1672. Rastad, E., 1981- Geological, mineralogical, and facies investigations on the Lower Cretaceous stratabound Zn–Pb–(Ba– Cu) deposits of the Iran Kouh Mountain Range, Esfahan, west Central Iran [Unpublished Ph.D. thesis]: Heidelberg, University of Heidelberg, 334 p.
Reichert, J. and Borg, G., 2008- Numerical simulation and a geochemical model of supergene carbonate-hosted non-sulphide zinc deposits, Ore Geology Reviews 33: 134–151. Reichert, J., 2007- A metallogenetic model for carbonate-hosted non-sulfide zinc deposits based on observations of Mehdi Abad and Iran Kouh, central and southwestern Iran [Unpublished Ph.D. thesis]: Shillong, University of Martin Luther, 129 p.
Slezak, P. R., Olivo, G. R., Oliveira, G. D. and Dardenne, M. A., 2014- Geology, mineralogy, and geochemistry of the Vazante Northern Extension zinc silicate deposit, Minas Gerais, Brazil. Ore geology reviews 56:234– 257. Takahashi, T., 1960- Supergene alteration of zinc and lead deposits in limestone. Economic Geology 55: 1084–1115. Taylor, J. H., 1958- The formation of supergene galena at Broken Hill, northern Rhodesia. Miner. Mag. 31: 908–913. Terracciano, R., 2008- Willemite mineralization in Namibia and Zambia. (dissertation) Università di Napoli. Wilkinson, J. J., Eyre, S. L. and Boyce A. J., 2005- Ore-forming processes in Irish-type carbonate-hosted Zn-Pb deposits: Evidence from mineralogy, chemistry and isotopic composition of sulfides at the Lisheen Mine. Economic Geology 100: 63–86.